Few days back we shared an infographic about how to Make Money Without Doing any Job and Smartphone Applications that Pay You. Today one of our reader shared a new infographic with us which helps you to learn how to make decent Money from your Blog and whats tips you hvae to follow to get some awesome revenue from your blog or website. The tips are pretty simple and works for most of the blog and website owners. The first and basic formula to get some extra revenue from your blog is marketing, first you have to learn how and what steps you have to follow to promote your blog on the web. Once you are getting some awesome traffic on your blog, then you have to follow some simple tips and implement them in your blog to get extra income on your account. In the below mention Infographic you will find some of the best and most useful monetization techniques which you will apply easily on your blog. To get started all you need a blog, if you are new to the blogging and don’t know how to start your first blog and which platform you have to choose to start a new blog, read our guide Start Your Blog With These 5 Free Blogging Sites. Once you are ready and want to know to how to monetize your blog, then read all the tips form the below mention infographic and try any of them on your blog. 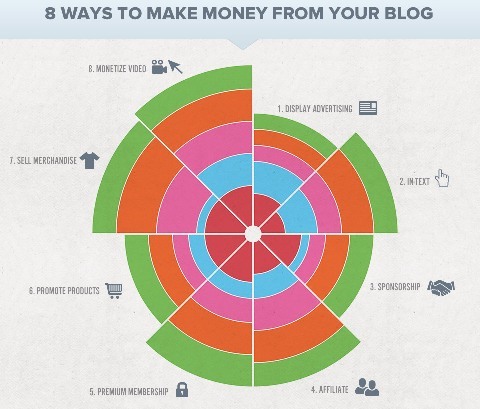 Thanks to Coull.com who released this new Infographic from which you will learn the Ways to Make Money from your Blog. Hope all the above mention ways will help all the new webmaster and blogger to earn some extra bucks. So let us know currently what strep you are following on your blog to gets some cash and from the above ingographic which ways you recommend to the new users. Leave your suggestion and tips in the comment box below.